This, together with the previously posted Lyons piece provides convincing arguments that Horne was indeed a victory. Great job, David and others at MALDEF! allow ELL children to become proficient in English. students become proficient in English. its obligation of providing “appropriate action” under the EEOA. 6. No ultimate determination has been made on any of the claims by the plaintiffs in the case. and to argue other changed circumstances. is insufficient to make a final determination. funding for quality educational programs will make a difference. Clearly, the debate is not over. under the EEOA by meeting its duties under the EEOA. Thoughtful commentary on common standards from blog.eduflack.com/2009/06/25/bolder-broader-accountability.aspx. Those who have done this dance enough times know that the work is only just beginning. The current common standard focus on high school exit expectations will have be walked back to first grade or kindergarten, providing common standards for the full K-12 effort. With those standards, we'll also have to build the assessments that go with it, how we measure both what is being taught and what is being learned in the classroom. One of the top concerns about common standards is that the current framework seems focused exclusively on reading and math skills, much as NCLB's AYP provisions were. We assume that science will be added. We hope to fold in social studies and other academic subjects. And the recent release of the arts NAEP last week gives us hope that there is a chance that we will truly gage student proficiency on all of the issues and topics addressed during the school year. * Collect state-level data -- from an expanded NAEP or from other national surveys -- on a broad range of academic subjects, as well as on the arts, student work habits, physical health and fitness, mental health, citizenship habits, and other appropriate behaviors that will enable students to achieve success in a pluralistic society and complex global economy. systems to evaluate school quality. * provide for the inspection of districts and schools to ensure that contributions to satisfactory student performance in academic subject areas, as well as in the arts, citizenship, physical fitness and mental and physical health, work, and other behavioral skills that will enable them to achieve success in a pluralistic society and complex global economy.Provide for the inspection of districts and schools to ensure that appropriate resources and practices, likely to produce satisfactory student achievement, are being followed and promoted. There are few that are going to feel lukewarm or ambivalent about BBA and its recommendations. EIther you've drunk the Kool-aid or you are a true nay-sayer/doomsdayer. Others will absolutely hate the approach. They will fear that BBA is looking to weaken current accountability models, and are claiming that adequate assessment of math and reading proficiency should no longer be a priority. It "softens" our current measurement efforts. It places the qualitative over the quantitative. And it turns back the accountability clock to when it was every state for itself, with each jurisdiction offering up some version of the good, the bad, and the ugly. it seeks to deal a setback to one of the real successes of the NCLB era. Will these recommendations become the centerpiece of ESEA reauthorization, either this year or sometime in the next decade? Probably not. But by throwing a spotlight on accountability at this stage of the game, BBA begins a very important debate when it comes to reauthorization. How do we effectively measure school improvement? What are the inputs and the outcomes we should be focused on? How do we capture the full picture, knowing that curricular changes alone cannot get us to the intended destination? How do we take issues like 21st century skills and STEM and figure out how to effectively layer them into the common standards and the assessments that will come along with those standards? How do we ensure that all parties, from the classroom up and the feds down, are actually being held accountable for student learning and student achievement? All are important debates we must have now, if a reauthorized ESEA is indeed an improvement over the current. Debate is a good thing. Discussion is a good thing. Even disagreement is a good thing when it comes to school improvement. We need choices and different ideas. We need devil's advocates and loyal soldiers. We need to seriously consider our choices (as well as weigh what has worked and what has not in the past) if we are to put real, lasting, meaningful improvement in place. So if BBA is lighting the match to start some of these debates, we are better for it. And for those who think that these accountability recommendations won't hold any water with the Obama Administration and EdSec Arne Duncan, take a look at the following video clips. Both candidate Obama's and President Obama's rhetoric seem far more like that of a true believer than a nay sayer. This may have more legs to it than it originally appears. BATON ROUGE -- A bill that aims to reduce Louisiana's chronically high dropout rates by creating a new "career track" high school diploma and relaxing the standards for promotion to ninth grade is on its way to Gov. Bobby Jindal's desk after the Legislature gave its final approval Tuesday. The Senate voted 38-0 to adopt minor changes made by the House to Senate Bill 259 by Sen. Robert Kostelka, R-Monroe, ending an unexpectedly smooth journey for a bill that has divided educators. Supporters said the new diploma, which would require increased vocational and technical training for students who don't plan to attend college, is needed to keep students in school who might otherwise join the 35 percent of Louisiana students who fail to earn a high school degree. I have good news to report regarding a major civil rights policy priority for the Alliance and the children we serve, ensuring the continuing vitality of the Equal Educational Opportunities Act of 1974 (EEOA). Yesterday, the U.S. Supreme Court handed down a 5-4 decision in the case of Horne v. Flores, a 17-year old Arizona civil rights case brought under the EEOA. The Court’s decision consists of the majority opinion, authored by Justice Alito, and a longer dissenting opinion authored (and delivered orally from the bench) by Justice Breyer representing the Court’s “liberal” Justices. The Court’s decision sends the case back through the Ninth Circuit Court of Appeals to the District Court for new hearings on whether Arizona, and the school district of Nogales are taking appropriate action to overcome language barriers which impede the equal educational participation and progress of language-minority students. The highly technical Horne decision was overshadowed by another Arizona school decision handed down by the Court yesterday, Safford Unified School District v. Redding, holding unconstitutional the strip search of a 13 year-old student suspected of having given ibuprophen to a fellow student. The Redding decision was 8-1, with only Justice Thomas finding the school’s actions constitutional. The Court’s decision in Horne upholds the EEOA and its mandate that schools must take “appropriate action to overcome language barriers that impede equal participation by its students in its instructional programs.” The Court rejected the state’s argument that the No Child Left Behind (NCLB) Act supersedes the EEOA in setting standards for what constitutes equal educational opportunity. The Supreme Court’s decision in Horne effectively expands the focus of the case from the relatively narrow issue of school finance to educational program outcomes and effectiveness, which, of course, is all that matters in the life of a child, any child, every child. When the case is retried by the Federal district court, the effectiveness of Arizona’s “unique” one-year program of 4 - hours per school day of “Structured English Immersion” (SEI) will be on trial. It is a trial that we can look forward to and must prepare for. Much about the Arizona SEI approach is already known. It has not closed the daunting achievement gap that divides Arizona students by race and language. Look, example, at last year’s 4th grade science test scores. Science, of course, is just one program, and the scores presented below are derived from a single test. Nevertheless, six times as many white students passed the AZ test of science achievement as did limited-English-proficient students. Even more stunning is the fact that while 31 percent of White students exceeded state standards, only 1 percent of LEP students did so. In addition to English language and content area student test scores, the trial court will examine data on broader measures of school success and failure including data on attendance, graduation, postsecondary enrollment and college completion and other outcome measures rehears the case. The trial court will also examine both the quantity and quality of resources provided by the State and the Nogales school district in terms of teachers, texts, parental involvement, and other instructional features and components. Later this year or in 2010, the federal district court will rehear Miriam Flores’ complaint. Not since the Supreme Court’s landmark 1974 decision in Lau v. Nichols have the legal questions been as direct and blunt: does Arizona’s SEI program enable limited-English-proficient national origin minority students to meet state performance standards, and does Nogales’ SEI program ensure LEP students equal educational participation and achievement. Going forward, AMME will work with the Flores parties in the pursuit of justice. We also look forward to working with President Obama and the United States Congress on the reauthorization of the Elementary and Secondary Education Act -- to reform, strengthen, and improve the education of language-minority students, and in the process, the standards and quality of language education for all students. James J. (Jim) Lyons, Esq. On June 21st, I posted some unfortunately damaging comments about Professor Michael Hart that i drew from an article titled, "One of Their Own; Alternative Racist Conference Welcomes Jews," written by Janet Smith in a publication by the Southern Poverty Law Center and that I have since taken down. I sincerely apologize for any harm that this may have caused. limitations that should have been shared in the report. charters are run by for-profit corporations. report and in later work with their data base. information and high quality analyses. To unsubscribe from future mailings, click here . "Mike asks and answers the following: But will we shut down 37 percent of all of the charter schools in the country because they perform worse than their traditional counterparts on math state tests? Or 83 percent of all charters because they perform worse or no better than their district peers? Let's assume that the CREDO study was overly pessimistic. Will we kill twenty-five percent of charters? Fifty percent? No. It's more likely that the charter movement will go in another direction, already foreshadowed by the reaction to the CREDO study." Interesting coverage of this debate. Read on. There's some consternation within the education establishment right now with what it sees as Arne Duncan's obsession with charter schools. There he is, warning states that they will lose out on "race to the top" funds if they don't eliminate their charter school caps. There he is, arm-twisting legislators in Tennessee to pass a stronger charter law. There he is, speaking at the National Charter Schools Conference about the key role that charters are expected to play in the stimulus-driven transformation of our system, including the reconstitution of failed district schools. But to the perturbed establishment I say: Take the long view. The fact that the school reform world is so invested in the charter movement will help you over time, if only because said reformers are learning how hard it is to boost student achievement and how unjust first-generation accountability systems are for gauging school performance. This isn't an entirely new development. Five years ago, when the New York Times published a front-page, AFT-seeded story about NAEP results that showed charters to be trailing their district-operated peers, charter advocates suddenly discovered "value-added assessment." It wasn't fair, they argued, to base judgments of school performance on such one-time "snapshots." Schools needed to be judged on the progress of their students over time. To which the establishment replied, "Hey, we've been saying that for years about No Child Left Behind. Welcome to the party." And so it came as no big surprise when then Secretary of Education Margaret Spellings allowed a few, and eventually all, states to move to a value-added system of accountability under NCLB. With both establishment and insurgents agreeing on the inadequacy of one-point-in-time measures, moving beyond them became politically inevitable. Fast forward five years, and consider how things have changed and how they have stayed the same. The insurgents have become the new establishment. Arne Duncan and most of his team are charter school enthusiasts, many of them having toiled in the fruitful vineyards of reform-minded outfits like the Gates Foundation and the NewSchools Venture Fund. They run the show now, at least in Washington. They have big bucks to throw around. And they are doing all they can to help their colleagues in the charter movement, particularly the corner of that movement that's about replicating schools with high test-scores and "bringing them to scale." Still, many charter supporters will agree with Secretary Duncan that the CREDO study is a "wake-up call" and that "the charter movement is putting itself at risk by allowing too many second-rate and third-rate schools to exist." We will close down the bad schools and multiply the good schools, they shout. And we could. And should. And in some places, already do. But will we shut down 37 percent of all of the charter schools in the country because they perform worse than their traditional counterparts on math state tests? Or 83 percent of all charters because they perform worse or no better than their district peers? Let's assume that the CREDO study was overly pessimistic. Will we kill twenty-five percent of charters? Fifty percent? No. It's more likely that the charter movement will go in another direction, already foreshadowed by the reaction to the CREDO study. Advocates will argue, first, that charter schools are getting decent results with a lot less money than traditional public schools. Show us more money and we'll show you better results! 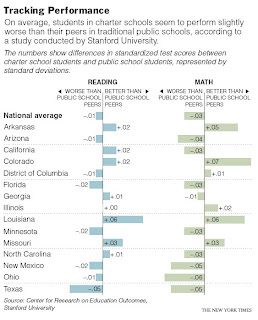 Second, charters will point to broader measures of success than test scores alone. Look how engaged students are in these smaller settings, they will say. Consider the award-winning character-education program. See how effective we are in preparing students for college. Notice the family atmosphere. Consider our arts program, our focus on the "whole child," and on and on. Such arguments aren't crazy. The "intangibles" of schools certainly matter as much to affluent families as test scores--maybe more. Why shouldn't they matter to poor families, and policymakers who share their concerns? Which brings us to the paper on school accountability released today by the "Broader, Bolder Approach to Education" crowd. Are you ready for some unexpected news? It is eminently sensible. That's a big surprise, for in the past this coalition has appeared eager to refight old battles about whether schools can be expected to help poor kids reach high standards. Now, however, it's arguing for a broader look at school success--what might be termed "test scores-plus." They would keep test-based accountability, tweaked in various ways (with progress-over-time measures, better assessments, a more robust NAEP, etc.) and supplement it with school inspectors. These inspectors would guard against lousy practices, such as "an undue emphasis on test preparation," and catch schools engaged in good ones, like "a collegial professional culture in which teachers and administrators use all available data in a collaborative fashion to continuously improve the work of the school." It's not hard to image charter advocates supporting such a system and believing that it will show their schools to have more supportive learning environments than what is found in a typical public school. Studies like the one from CREDO might show lackluster test results, but look at the whole picture and the story is much brighter, they will say. So public education groups: If you seek a kinder, gentler approach to school accountability, keep rooting for Arne and company to continue their magnificent obsession with charters. Because the more real-life, in-the-schools experience the reform crowd gains, the more appealing these second-generation accountability systems are likely to be to them. And with the "new establishment" already calling for "more money"--well, their agenda is your agenda, too. A perennial question: How does the performance of students in charter schools and students in traditional schools compare? CREDO set out to answer this question in a longitudinal analysis of roughly 2,400 charter schools, operating in 16 states and comprising roughly 70 percent of the US charter school population. Let's break it down. Fundamental study design: Sound. Findings: Mixed. Explanation of analysis: Sloppy. Let's hit them in turn. The methodology is based on a "virtual twin" approach. Specifically, each charter school student was matched by demographics and test scores with a student from the traditional public school (TPS) he or she had attended before switching schools (i.e., the "feeder school"). Then, gains in math and reading for the two groups of students were evaluated and the student-level results extrapolated to determine whether a charter school was serving its students better, the same, or worse than its matched TPS. Absent a randomized study, this is a reasonable approach to this kind of comparative analysis, and one that helps ameliorate, though not eliminate, selection bias (i.e., inherent differences between charter and traditional public school students). Next, the findings. On average, 46 percent of charter schools have math gains that mirror the gains of the matched TPS; 17 percent of charter schools made more progress in math; and 37 percent post math gains lower than their TPS counterpart. In reading, charter schools students do a bit worse than their TPS peers but the difference is so small (less than 1 percent of a standard deviation) that it's not meaningful. Notably, low-income students and English Language Learners fare better in charter schools than in TPSs, though black and Hispanic students do not. It's surely troubling that over a third of charters do worse than traditional schools in boosting math skills, but we should keep a few things in mind. Most importantly, the negative findings can largely be explained by the fact that over 50 percent of charter school students in the study were brand-new to their schools. Past research (see here for instance) and common sense tell us that kids in their first year at a new school don't initially perform well, and often maintain achievement gaps left over from previous instructional deficiencies. These same students will start to show gains in their second, third, and fourth years, and beyond. CREDO's results confirm this: When student performance is disaggregated by length of enrollment, first year charter students experience negative impacts on learning; second year students show no difference in learning gains; and third year charter pupils experience small but significant gains in reading and math. CREDO should have made this more explicit. Unfortunately, we're never told exactly how many students fall into each of these three buckets--just that "more than half of the records" are in bucket one. For a well-regarded research shop, that's a critical number to gloss over. And it isn't the only startling omission: Sample sizes for schools and for students in both the overall analysis and the state-level analyses are also missing. It's not even clear how many and which years of data were collected. Then there's the mystery of Massachusetts. The study is supposedly a "16 state" analysis--but results for only 15 are presented (see page 9). It's possible that the Bay State was used as a base comparison for other states--in other words, as a "reference category" when creating the dummy variables for the analysis--but that doesn't explain why it was left out in the state-by-state findings (see pages 35-37). Did CREDO forget about it? Frankly, the entire report needs some analytic housekeeping, including an upfront admission that the charter sample is mostly composed of recent transfer pupils. But it's still an important contribution to the field, and one that has gotten ample media attention. Its final recommendation is particularly on target: The charter movement must remove barriers to entry and exit, for high-performing schools in the first case and low-performing ones in the latter. You can read the report, including state-level findings, here. Hmm. Is this a real victory or a contingent one? The role of the students' native language is not integral to this court decision and this has everything to do with how successfully these youth will progress through our system. WASHINGTON, D.C. – In the first decision by the Supreme Court interpreting the rights of English Language Learner (ELL) students under the Equal Educational Opportunities Act (EEOA), the Court today rejected a challenge by Arizona’s Superintendent and others seeking to diminish the State’s role in affording ELL students the opportunity to learn English. The defendants had argued that the State’s compliance under the No Child Left Behind Act (NCLB) amounted to compliance under the EEOA, but the Court instead held that compliance under NCLB is not determinative and remanded the issue that states be conscious and meet their important obligations under EEOA. In support of the plaintiffs in this case, MALDEF and other national civil rights groups submitted an Amicus Brief  and argued that Congress never intended to absolve a State of its responsibilities under the EEOA. The Court agreed. Plaintiffs, a class of ELL students in Nogales, Arizona, brought this action in 1992 arguing that the State had failed to assist ELL students in overcoming their language barriers under the EEOA. Plaintiffs prevailed and subsequently, the State failed to fund programs adequately for ELL students. Although the Supreme Court held that a claim of inadequate funding standing alone is insufficient under the EEOA, the Court remanded the question of funding to the district court for further findings, as well as a number of other evidentiary questions that will have to be answered in light of the opinion. Michelle Rhee, the chancellor of public schools in Washington, has turned education reform heads across the country by arguing, often loudly, that our current education system puts the interests of adults above the interests of children. In December, she appeared on the cover of Time magazine in front of a blackboard, straight-faced, clutching a broom. The New York Times columnist Nicholas D. Kristof labeled Washington as school reform’s “ground zero.” Yet in her own backyard, Rhee is making policy decisions that are explicitly designed to make adults look good, even as many children are left behind. Press Office 400 Maryland Ave., S.W. others will be phased in over the next few months--are designed to increase postsecondary enrollment, particularly among low- and middle-income students. At his first White House press corps briefing, Secretary Duncan outlined the Administration’s plan for streamlining the FAFSA. questions from the FAFSA form that have little impact on aid awards and can be difficult to complete. Only questions that rely upon information that applicants must already provide to the IRS would remain. proposal would make these policies permanent and ensure the Pell Grant continues to grow steadily by making it an entitlement. Together, they provide approximately $200 billion in college scholarships and tax credits over the next decade. billion in Perkins Loans and continuing the low five percent interest rate, President Obama hopes that the neediest of students will have access to federal financial resources they did not have before. from disadvantaged backgrounds. These funds would be used to evaluate programs aimed at increasing college enrollment and graduation, and to grow and bring to scale programs that are proven to be successful. circumstances, such as unemployment, not reflected on the original application. “Simplifying the FAFSA is another significant action in our quest to keep a college degree within the reach of every person who aspires to higher education,” Duncan said. More information on federal financial aid for college is available at http://studentaid.ed.gov. nearly $200 billion in new scholarships and tax credits for college tuition, and Vice President Joe Biden is examining new ideas for college affordability through his Middle Class Task Force. of the aid awards undermine student aid’s ability to reach students who are unsure whether they can afford college. And there are 1.5 million enrolled students who are probably eligible for Pell grants but failed to apply. the remaining financial questions with data from the Internal Revenue Service (IRS). • More Information: Since May, the Education Department has provided students instant estimates of Pell grant and student loan eligibility, rather than forcing them to wait weeks, and a link to more college information such as graduation rates. intended only to determine whether parental information is necessary. Other improvements will allow men older than 26 to skip the question about Selective Service registration and consolidate the three questions on homelessness. will be asked about prior drug convictions because the question does not affect first-year students. And the Education Department will work with state agencies to make it easier to answer questions that the states need but the federal government does not. SECOND: Eliminate Questions through Legislation. Applying for financial aid is far more complicated than filing a tax return; students and their parents must answer dozens of questions about their income and assets that are not on the federal tax form. for college and opening up loopholes for sophisticated applicants to game the formula. changes would make the student aid application simpler and fairer, and they would open the door to using IRS data for the remaining financial questions, reducing the FAFSA to easy personal questions. THIRD: Answer the Remaining Financial Questions with Tax Data. When applying for student aid, more than 90 percent of students and families are giving the federal government information it already has–information they provided when they filed their taxes. The answer to up to 20 financial questions–all questions that will remain if the proposed legislation is enacted–could be provided by the IRS. Students applying online will only need to provide easily available personal information. working together to examine the possibility of expanding this option to all students in the future. of college graduates in the world. would make these policies permanent and ensure the Pell Grant continues to grow steadily by making it an entitlement. Together, they provide approximately $200 billion in college scholarships and tax credits over the next decade. $5 billion in additional Perkins Loans and continuing their low five percent interest rate, President Obama hopes that the neediest of students will have access to additional federal financial resources they did not have before. disadvantaged backgrounds. These funds would be used to evaluate programs aimed at increasing college enrollment and graduation and to grow and bring to scale programs that are proven to be successful. • Helping Families Save for College: The President’s Middle Class Task Force has directed the Treasury Department to investigate ways for 529 savings plans to more effectively and efficiently help families save for college. This is a great discussion on charter schools. Also, check out the recently-released report [pdf] by CREDO out of Stanford on Charter Schools. Also check out the video footage of this discussion. Bob Peterson, founding editor of Rethinking Schools. He teaches fifth grade at a public school in Milwaukee, Wisconsin. He co-edited the book Keeping the Promise? : The Debate over Charter Schools. JUAN GONZALEZ: The Obama administration has made opening more charter schools one of its top priorities in its plans to improve the nation’s education system. On Monday, Education Secretary Arne Duncan spoke at the annual gathering of the National Alliance for Public Charter Schools in Washington, DC. ARNE DUNCAN: So I’m a big, big supporter of these successful charter schools, and so is the President. And that’s why one of our top priorities is a $52 million increase in charter school funding for our FY 2010 budget. JUAN GONZALEZ: Duncan is pushing aggressively to expand the number of charter schools around the country, and the Obama administration has been working to persuade state legislators to lift caps on the number of charter schools. According to Education Department figures, there are currently some 4,600 charter schools operating around the country. They now educate some 1.4 million of the nation’s 50 million public school students. The schools are financed with taxpayer money but operate free of many curricular requirements and other regulations that apply to traditional public schools. In his remarks on Monday, Education Secretary Duncan also addressed some criticisms of charter schools as anti-union and pro-privatization. ARNE DUNCAN: We also need to work together to help people better understand charters. Many people equate charters with privatization, and part of the problem is that some charters overtly separate themselves from the surrounding district. This is why opponents often say that charters take money away from public schools. And we all know that’s absolutely misleading. Charter schools are public schools serving our children with our money. Instead of standing apart—instead of standing apart, charters should be partnering with districts, sharing lessons and sharing credit. Charters are supposed to be laboratories of innovation that we can all learn from. And charters are not inherently anti-union. Albert Shanker, the legendary former head of the AFT, was an early advocate. Many quality charters today actually are unionized. What distinguishes great charters is not the absence of a labor agreement, but the presence of an educational strategy built around commonsense ideas, more time on task, aligned curricula, high parent involvement, great teacher support and strong leadership. JUAN GONZALEZ: The gathering of the National Alliance for Public Charter Schools came on the heels of a new report by Stanford University’s Center for Research on Education Outcomes, or CREDO. The report found that, on average, students in charter schools were not faring as well as students in traditional public schools. In his address, Education Secretary Duncan addressed the findings of the report and said that only high-quality charters should be allowed to operate. ARNE DUNCAN: The CREDO report last week was absolutely a wake-up call, even if you dispute some of its conclusions or its language. The charter movement is putting itself at risk by allowing too many second-rate and even third-rate schools to continue to exist. Your goal should always be quality, not quantity. Charter authorizers need to do a better job of holding schools accountable, and the charter schools need to support them loudly and sincerely. I absolutely applaud the work that the Alliance is doing with the National Association of Charter Schools Authorizers to strengthen academic and operational quality. We need that. We also need to be willing to hold low-performing charters accountable. AMY GOODMAN: Education Secretary Arne Duncan speaking in Washington, DC. Well, among those who also addressed the National Alliance for Public Charter Schools yesterday was the lead author of that Stanford University report, Kenneth Surratt. He is assistant director of the Center for Research on Education Outcomes at Stanford. He joins us also from Washington, DC. And we’re joined by Bob Peterson, the founding editor of Rethinking Schools. He teaches fifth grade at a public school in Milwaukee, Wisconsin, co-editor of the book Keeping the Promise? : The Debate over Charter Schools, joining us from Milwaukee. We welcome you both to Democracy Now! Kenneth Surratt, let’s begin with you. Your major findings in this report? KENNETH SURRATT: The major finding is that, on average, charter school students in the sixteen states that we looked at are performing a little bit below their traditional public school peers. JUAN GONZALEZ: And, Bob Peterson, could you expand on that? Because that is definitely going against the grain of what most charter school—the charter school movement is telling the public. BOB PETERSON: Yeah. I think it’s really important to see that, on page thirty-two of their report, they reported that black and Hispanic students scored significantly lower in charter schools, significantly lower than their counterparts in public schools. That’s just in math and reading. I mean, there’s good charter schools, and there’s bad charter schools, just like there’s good public schools and bad public schools. The question is whether or not charter schools can be an engine for reform of public education. Obama and Duncan seem to think so. I’d completely disagree. AMY GOODMAN: Kenneth Surratt, this report that you came out with, it was more being framed by Arne Duncan that there are some problem schools. But the fact that your report found that, on average, kids in these schools across the country are doing worse, isn’t this a major blow to the charter school movement? KENNETH SURRATT: I don’t think so. One of the findings—we looked at over 2,400 schools within our study, and on average—and we did what we call a quality curve, and 46 percent of the charter schools are doing statistically insignificant differently than their traditional public school peers. Seventeen percent are outperforming. But the sobering part is that 37 percent are underperforming compared to their peers. But, you know, what we feel is that charters, once they get back to this focus of the trade-off that they had for flexibility, for accountability, you know, and closing those underperforming schools and finding ways to replicate the higher-performing ones, that the movement could continue to grow. JUAN GONZALEZ: Kenneth Surratt, I’d like to ask you about the mix of schools that you analyzed. I know you had numerous states. But it’s been my experience, at least with the charter school movement here in New York City, that most charter schools start out at the lowest grades. There are some high school, but most start out at kindergarten, first and second, and then build up. And those are generally the easiest grades to deal with. Not as many start at the intermediate or high school level, where you could really gauge whether a genuine substantive progress is being made. What is your—in your study, what was the mix between primary, intermediate and high schools that you looked at across the country? KENNETH SURRATT: You know, I don’t have an exact breakdown of the number of schools in each one of those. But what made our analysis—we did look at performance at elementary, middle, high school and multi-level schools and found that actually elementary and middle schools were actually outperforming their traditional public school peers. The way—the measure that we used is growth on their—each state’s test. And because testing is generally from third to eighth grade, so we can’t even really look at the schools who just have kindergarten through third grade, because we haven’t gotten a growth score on those yet. AMY GOODMAN: Bob Peterson, talk overall about the growth of the public charter school movement, where it’s come from, who is behind it, and then how you’re organizing with public school teachers around the country. BOB PETERSON: Yeah, the charter school movement started, I think, with very well-intended individuals who wanted to be free from what they considered bureaucracy and some rigid union contracts and that their core beliefs or their assumptions were that once they had that freedom, they would increase academic achievement and that they would be innovative and that, furthermore, that those lessons would be shared with the public schools. That just hasn’t been the case. There’s no state or district where charter school policies have really been transformative in that way. And that, in fact, is why we need a public education. In a democracy, we have to service all kids. And oftentimes we find in charter schools there is some picking and selecting of children through rigorous or complicated application forms, and so on and so forth. The other thing that’s really important to keep in mind is that while the charter school movement includes some very well-intended individuals and some quality schools, it’s also become a favorite of conservative forces and conservative foundations that have really championed charterizing and the marketizing, as I say, the whole public sphere of public education. And so, they would like to see more private control of schools, less union, quote, “interference.” And it’s a very disconcerting problem, because those of us who have the interests of all kids at heart know that there’s inherent problems in a market solution. And so, what we really need to do is to challenge this notion that the charters are the engine of reform. There are a lot of different ways that schools can be reformed. There’s no silver bullet. But it’s not—unfortunately, it’s not the charter movement, which apparently Obama and Duncan have seen fit to say is the silver bullet. AMY GOODMAN: Can you talk about Arne Duncan, his background in Chicago? BOB PETERSON: Yeah, Arne Duncan, we did a cover story in our Rethinking Schools magazine, “The Duncan Myth,” just in our spring issue. And Duncan was basically the CEO, as they’re called, of the Chicago school system. He championed—he worked with the mayor, of course, and in fact he says that he’s for mayoral control of many school districts—in my mind, an anti-democratic tendency, if we’ve ever seen one. He did a number of things. His claim to fame was really closing down schools that didn’t work, although, in the process, he alienated huge swaths of the community in Chicago. There were supposed to be public hearings, which he never attended. I mean, there were hearings, but he didn’t go, his people didn’t go. And these number—over twenty schools were closed down and then reopened up under a plan of Renaissance 2010. The problem is, a lot of the neighborhood kids who were served by these schools, whose parents wanted them to stay open, were excluded through a variety of means in the new schools that opened up, the more boutique charter schools that sometimes occur throughout this country. The question—and the other thing that he did that’s of interest to many of your viewers, I’m sure, is that he opened up five military academies, schools, and expanded the ROTC program in middle school or junior high school, something which some of us have some serious concerns about, whether or not that should be how we channel students through the public schools. AMY GOODMAN: We’re going to break, then come back to this discussion. We’re talking to Bob Peterson, founding editor of Rethinking Schools, fifth grade teacher at a public school in Milwaukee, Wisconsin. And we’re joined by one of the lead authors of the Stanford University report “Multiple Choice: Charter School Performance in 16 States,” that Education Secretary Arne Duncan cited yesterday in his meeting with schools around the country, Kenneth Surratt, assistant director of the Center for Research on Education Outcomes at Stanford. Stay with us. AMY GOODMAN: In a few minutes, we’re going to be talking about the censorship of the internet in Iran and the European companies that are providing the technology for that, well, there in Iran and here at home in the United States. Then we’re going to look at the Guantanamo prisoners, the Uyghurs, and a video that just has come out showing one of those prisoners, who has been held for years at Guantanamo, was tortured by al-Qaeda and held by the Taliban for a year and a half, before being held at Guantanamo. But we’re continuing now on charter schools. Kenneth Surratt with us, assistant director of the Center for Research on Education Outcomes at Stanford University, just came out with a big report, “Multiple Choice: Charter School Performance in 16 States.” And Bob Peterson, a fifth grade teacher in Milwaukee, Wisconsin, founding editor of Rethinking Schools. I’m Amy Goodman, with Juan Gonzalez. Juan? JUAN GONZALEZ: Well, Kenneth Surratt, I’d like to ask you again about your study. Again, my experience in reporting on the charter school movement here in New York City is that the charters tend to have far fewer percentages, compared to the public schools, of special education children or children—immigrant children, perhaps—who are limited English proficient. I’m wondering if, in your study of other states around the country, you found a similar situation that may, to some degree, skew the actual performance, the achievement levels, of the students in those charter schools? KENNETH SURRATT: Actually, our study found that students with special needs in the charter schools are outperforming their peers in math and on par with their traditional public school peers in reading. English language learners, we actually found, are doing better than their traditional public school peers in both reading and math at significant levels. JUAN GONZALEZ: But are the percentages in the charters comparable to those in the public school systems from which they come? KENNETH SURRATT: You know, I think it varies state by state. In each location that we looked at, I believe there were some that were higher. Most were about on par. But I didn’t see a significant difference in any of the states that we looked at. JUAN GONZALEZ: And, Bob Peterson, I’d like ask you, in terms of the fact that most charter schools are also nonprofit—run by nonprofit organizations and can bring in foundation and other funding, I found increasing problems in disparities in the pay scales of the directors of these nonprofits, much higher salaries than your normal public school principals would have. I’m wondering, your concern about the accountability factor of these charters, since they are not directly controlled by the local public school system? BOB PETERSON: I agree. There’s real accountability factors. And I just want to go back to the special needs issue. I mean, if you look at the Stanford report on Illinois, for example, 15 percent is the average number of special needs students in public schools, and only ten percent in the charter schools. Now, that actually is significant. And it’s not just a matter of how well those students are doing; it’s the impact on the classroom teacher. I’ve taught for nearly thirty years. I know the difference between having just a few special needs children in a classroom and having a lot more. And we find this in Milwaukee, too, where not only the charter schools, but we have a publicly funded private voucher program, which have very few special needs kids. And the concern I have is that we’re setting up a two-tier system, where there is the most difficult-to-educate kids, a higher percentage of special needs, English language learners, kids who are counseled out of charter schools and voucher schools because of discipline problems—they end up in the public schools, where there’s a self-selected group in the charter schools. That’s not right. We should really hold public charter schools—coming back to your question about accountable—to serving the children of all families in our district and having transparency, so we know when kids are being counseled out, when kids are basically being kicked out of schools. Just, we should not have charter schools emulate some of the worst aspects of public schools, because in some public schools there are admissions standards, there’s basically discrimination, not full access towards the kids who need it most. We should be trying to reverse that trend, not accentuate it by promoting these kind of charter school solutions. The Obama administration has made opening more charter schools a big part of its plans for improving the nation’s education system, but Education Secretary Arne Duncan will warn advocates of the schools on Monday that low-quality institutions are giving their movement a black eye. “The charter movement is putting itself at risk by allowing too many second-rate and third-rate schools to exist,” Mr. Duncan says in prepared remarks that he is scheduled to deliver in Washington at the annual gathering of the National Alliance for Public Charter Schools. In an interview, Mr. Duncan said he would use the address to praise innovations made by high-quality charter schools, urge charter leaders to become more active in weeding out bad apples in their movement and invite the leaders to help out in the administration’s broad effort to remake several thousand of the nation’s worst public schools. Mr. Duncan’s speech will come at a pivotal moment for the charter school movement. The Obama administration has been working to persuade state legislatures to lift caps on the number of charter schools. At the same time, the movement is smarting from the release last week of a report by Stanford University researchers that found that although some charter schools were doing an excellent job, many students in charter schools were not faring as well as students in traditional public schools. “The charter movement is one of the most profound changes in American education, bringing tremendous new options to underserved communities,” Mr. Duncan is to say in the speech, the text of which was provided to The New York Times by his advisers. But, the speech says, states should scrutinize plans for new charter schools to allow only high-quality ones to open. In exchange for the autonomy that states extend to charter schools, states should demand “absolute, unequivocal accountability,” the speech says, and close charter schools that fail to lift student achievement. The Stanford study, by the Center for Research on Education Outcomes, used student achievement data from 15 states and the District of Columbia to gauge whether students who attended charter schools had fared better than they would if they had attended a traditional public school. Reports on charter schools often arouse impassioned debates, because charter schools in some cities have drawn millions of dollars in taxpayer money away from traditional public schools, and because many operate with nonunion teachers. The Stanford study was no exception; some charter school advocates asserted that it was slanted to favor traditional public schools. Mr. Smith praised the administration’s efforts to increase financing for charter school startups. Mr. Smith said he believed that some charter school operators would react favorably to Mr. Duncan’s call, but only if they were given flexibility over hiring and firing teachers, structuring student learning time and other issues. “They have to be able to maintain the integrity of the charter model,” Mr. Smith said. Seven years ago, a rally at the Department of Education promoted one of then-President George W. Bush's most significant domestic achievements -- the No Child Left Behind law. The backdrop: a red schoolhouse. 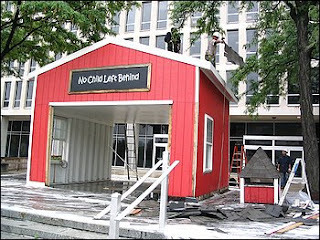 "We serve the ideal of the little red schoolhouse," then-Education Secretary Rod Paige said of the structure attached to the agency's main entrance on Maryland Avenue SW. "It is one of the greatest symbols of America -- a symbol that every child must be taught and every child must learn." But now that symbol has been ripped down. The Obama administration has made clear that it is putting its own stamp on education reform. That will mean a new name and image for a law that has grown unpopular with many teachers and suburban parents, even though it was enacted with bipartisan support in Congress. "It's like the new Coke. This is a rebranding effort," said Joe Williams, executive director of Democrats for Education Reform. "The feng shui people believe you need to take the roof off buildings to allow bad chi to escape. Let's hope this helps." The 2002 law dramatically expanded the federal role in public schools. It mandates math and reading testing for millions of students and penalizes schools with too many youngsters who fail those exams. During his run for office, President Obama said he wanted to change the law to do more to help schools, "rather than punishing them." Education Secretary Arne Duncan has called the law's name "toxic." Toxic or not, is No Child Left Behind headed for extinction? Lawmakers have yet to tackle an overhaul, and Duncan has not offered specifics on how he would like to see the law revamped. But the administration has said it will not back down from testing students or holding schools accountable. Duncan has said he wants even higher standards that measure U.S. students against peers worldwide. But he said states and schools should have more flexibility in achieving goals. Frederick M. Hess, director of education policy studies at the American Enterprise Institute, said Duncan sometimes sounds a lot like former Bush education secretary Margaret Spellings. Like Spellings, Duncan has been promoting charter schools and merit pay for teachers. "Other than kind of the aesthetics of it, it's not clear the schoolhouse represents anything more substantial," Hess said. No Child logos on the Education Department elevators are being stripped. Official correspondence to states now refers to the law's original name, the Elementary and Secondary Education Act of 1965. On Saturday in a steady rain, construction workers pulled down the schoolhouse and its No Child Left Behind sign. Instead, photos of students, from preschool to college age, are going up on 44 ground-floor windows, forming an exhibit that can be seen from outside. There are images of young people reading, attending science class and playing basketball. In a note to his staff yesterday, Duncan said the photos should "serve as a daily reminder that our mission is about helping kids." Matthew Yale, deputy chief of staff for Duncan, said the department is considering a contest to rename the law. "We want to think about something that's forward-looking instead of something that seems to have a negative connotation," Yale said. "We want to think of something that talks about future and potential." Education blogger Andrew Rotherham, a former member of the Virginia Board of Education, posed the same question a few months ago. He got a slew of answers. Some were sincere: "Successful Schools for a Strong America Act." Some less so: "Don't task, don't fail act"; "No nutty education reform idea left behind"; and "Caitlin. Everybody seems to be naming things Caitlin these days." Cohen is right, this IS a step backwards. This is similar to the concerns about This session's House Bill and Senate Bill 3 in Texas. Using tracking as a solution to curb dropout without addressing other school factors that contribute to student push-out (e.g., teacher and counselor shortage, teacher quality, test-driven curriclum, etc.) is poor policy. BATON ROUGE - High school students could skip college prep courses and instead take classes designed to get them into two-year schools under a plan that Louisiana lawmakers are expected to approve despite criticism that it would produce graduates who can't find jobs. awmakers are expected to send the bill to Gov. Bobby Jindal in the next few days, over the objections of some national education groups who say the changes would dilute the state's recent work to improve public schools. They say the legislation lowers standards beginning in eighth grade and would produce graduates who struggle to find work because they never mastered basic reading, writing and mathematics. "One way to raise achievement is to raise expectations, with a more rigorous curriculum, and Louisiana has done a good job of that recently," said Michael Cohen, president of Achieve, a nonprofit organization that works to raise states' academic standards. "But we're concerned that this legislation would be a step backward." The governor's aides have said Jindal supports the bill. Under the legislation, parents could allow their children 15 and older to leave pre-college curriculum and instead take the "career option program." Graduates who took the new curriculum would get a career-option diploma that would not qualify them for a four-year college or university. Instead, they could attend two-year technical schools or community colleges. Few legislators oppose the bill. They say the new curriculum would reduce the number who drop out and often turn to drugs and crime when they can't find jobs. "As we push out and drop out these students, many of them end up on the streets, and many of them end up incarcerated," said state Rep. Jim Fannin, D-Jonesboro, one of two sponsors of the plan. The other sponsor, state Sen. Robert Kostelka, R-Monroe, has said he supports it because in his former position as a state district judge he was often forced to send teenagers - high school dropouts - to prison. Kostelka said the career program will keep those children in school, learning skills that will win them jobs after graduation. Critics, including Superintendent of Schools Paul Pastorek, insist the curriculum change would have the opposite effect that Fannin and Kostelka envision. Cohen and the presidents of two other national education groups last week sent a letter to the chairmen of the House and Senate education committees, urging them to oppose or rewrite the legislation. Teacher education programs are now required to meet higher standards or increase their emphasis on classroom training in order to achieve accreditation, according to new guidelines being announced today by the National Council for Accreditation of Teacher Education. One of the organization's new requirements asks teacher education programs to "demonstrate continuous improvement toward excellence." This means they must meet NCATE's highest -- not just "acceptable" -- levels of achievement in six areas, ranging from candidate knowledge and diversity to faculty qualifications. For instance, whereas the acceptable level requires professional education faculty to have "earned doctorates or exceptional expertise that qualifies them for their assignments," the superior level additionally requires that they "have earned doctorates or exceptional expertise, have contemporary professional experiences in school settings at the levels that they supervise, and are meaningfully engaged in related scholarship." With regard to the program's finances, NCATE's "acceptable" level calls for a budget that "adequately supports on-campus and clinical work,"
to P-12 education and other programs in the institution." Alternatively, institutions can establish programs that foster real-world classroom training or research about teacher education. NCATE President James Cibulka said the revisions mark the "biggest change in NCATE's accreditation process in the last 10 years." "We need to recruit a diverse and talented teaching force," he said. "We need to induct novice teachers to their profession and to retain them once they are highly functional teachers, we need to raise achievements, we need to prepare teachers who can work with a more diverse student population. There are a whole host of challenges there and we believe the institutions that prepare teachers should be addressing those needs." The majority of NCATE's 632 accredited colleges of education do not currently meet the "target" level of achievement,according to Cibulka. They have until 2012 to either raise their curriculum to that level or develop a new training or research program. Larry Johnson, dean of the University of Cincinnati College of Education, Criminal Justice and Human Services, said that meeting the NCATE requirements is "critical" for American education, but may be difficult to measure in concrete terms. "It's really hard, any time, to hold people accountable to the impact of something they're doing," he said, adding, "You can't have 'highly trained' teachers unless you can demonstrate they impact the students they can teach." In the past, supporters of a traditional curriculum have criticized NCATE for being too ideological. In 2005, the National Association of Scholars filed a complaint with the U.S. Education Department regarding the organization's "dispositions" requirement, which NCATE expects education programs to use to measure students' teaching capability. At the time, "social justice" was listed as a quality that students should have; the phase was removed soon after. Glenn Ricketts, a spokesman for the National Association of Scholars, said the new NCATE requirements sounded "encouraging," based on a description provided before the document's release. "We'd like to see far more content-based education for teachers of history or English than simply pedagogy (and) things like service learning or community activism," he said. "We're hoping that this is an improvement." The new requirements ultimately aim to dispel the notion that "what happens in a university is kind of an ivory tower perspective," said David Burgin, an economics teacher at Science Hill High School in Tennessee. He advised NCATE on forming its new standards after helping develop a local teacher-training program. "In the past it's sort of been, 'What can we do to get approval? Check check check, OK, we're done,' " he said. "Whereas I feel like what we're asking NCATE to do ... is to develop relationships and see a product, not a finished work." Frank B. Murray, president of the Teacher Education Accreditation Council -- a group formed as a rival to NCATE, but which has, more recently, been working with it -- praised the changes being announced today. "The changes NCATE is proposing are very much in line with TEAC's principles," he said. "We are eager to see how the field responds to NCATE's ambitious plans because they fit so well with TEAC's approach. We have nothing but applause for this effort." CHICAGO, June 23, 2009 /PRNewswire-USNewswire via COMTEX/ -- The ASPIRA Association announced a $1.65 million grant from the Wal-Mart Foundation to significantly expand its ASPIRA Clubs, a Latino youth leadership dropout prevention model to stem the exceedingly high dropout rate among our nation's youth. The dropout rate among Latino youth, at over 40 percent, is the highest of any group in the country; triple the rate of white students. In many U.S. inner-city schools, the dropout rate is over 80%. Almost half of Latinos over the age of 25 have not graduated from high school. Since the Hispanic population is the fastest growing -- and youngest -- ethnic group in the country, the long-term implications of their high dropout rate on the nation's future economic competitiveness and social well-being cannot be overstated. "This very generous grant from the Wal-Mart Foundation will allow ASPIRA to expand its signature program, the ASPIRA Clubs, to thousands of Latino youth -- not only in the seven states and Puerto Rico in which ASPIRA currently operates, but across the nation to ensure thousands of students complete high school and pursue higher levels of education," said Ronald Blackburn-Moreno, president and CEO of ASPIRA. "We are very proud of our partnership with the Wal-Mart Foundation and grateful for their support. It demonstrates Wal-Mart's strong commitment to the Latino community and to the education of our nation's youth. We will now be able to work with organizations across the country to bring this model to schools and communities that are struggling to increase the graduation rates of Latino students." According to Blackburn-Moreno, today over 33 percent of U.S. Latinos are under 18 years of age, represent over 20 percent of all students enrolled in U.S. schools, and by 2050, they will constitute 25 percent of our country's workforce. "Unless we address and correct this situation the U.S. will not be able to sustain its competitive edge in a 21st century economy with almost 20% of its population undereducated," he explained. "For almost 50 years, the ASPIRA Leadership Clubs in schools have been an effective model to ensure Latino students graduate from school and go on to college," said Margaret McKenna, president of the Wal-Mart Foundation. "We're proud to provide funding from the Wal-Mart Foundation to assure the continued success of ASPIRA Clubs and -- more importantly -- the continued success of Latino youth." "The challenge facing ASPIRA over the years is the capacity to truly expand the program nationally, to bring it to schools and communities with high concentrations of low-income Latino students so we can have a meaningful impact on this national problem," said Blackburn-Moreno. The ASPIRA Association is the largest national Latino organization in the country and the only one dedicated exclusively to the education of Latin youth. Founded in 1961, ASPIRA's core program has been the ASPIRA Leadership Clubs in schools. In addition, ASPIRA provides a host of after-school programs including tutoring, mentoring, math and science enrichment programs, financial literacy, parental engagement and access and training in technology, in addition to operating nine charter schools. Wal-Mart Stores, Inc. and the Wal-Mart Foundation are proud to support the charitable causes that are important to customers and associates in their own neighborhoods. Through its philanthropic programs and partnerships, the Wal-Mart Foundation funds initiatives focused on creating opportunities in education, workforce development, economic opportunity, environmental sustainability, and health and wellness. From February 1, 2008 through January 31, 2009, Wal-Mart - and its domestic and international Foundations - gave more than $423 million in cash and in-kind gifts globally. To learn more, visit www.walmartfoundation.org. Tom Horne to Ethnic Studies: Drop Dead! Is AP for All A Formula For Failure? Does NCLB tutoring improve student learning?